The 2018 midterms have the potential to be historic for youth political participation, with young people receiving campaign outreach, paying attention, and intending to vote at unusually high levels (34% “extremely likely” to vote) that come close to the levels of engagement seen in the 2016 presidential election. Young people who report being actively engaged with the post-Parkland movement for gun violence prevention are even more likely (50%) to say that they’re extremely likely to vote. Our poll reveals strong support overall for Democratic candidates in Congressional elections (45% plan to vote for Democrats, versus 26% for Republicans), but large disparities among different demographic groups of young people, with Black and Latino youth much more likely to support Democratic candidates, young white men actually favoring Republicans, and unaffiliated white youth spreading their support across various parties and ideologies. We also find that, for all the focus on young people’s engagement with political content online, family remains the most important way for youth to learn about the election and the most influential in their engagement and participation. Much more is here, and this is just the first in a series of analytical posts drawn from a new survey of 2,087 people aged 18 to 24 in the United States, with representative over-samples of Black and Latino youth, and of 18 to 21-year-olds. It’s true that precincts with lots of youth or people of color tend to be located in the City of Boston, where Pressley has been a councilor. So it could be that she performed best within her own jurisdiction. (She is a respected veteran elected official, even though she is sometimes portrayed simply as an insurgent.) However, she also won precincts outside of Boston that have favorable demographics. I find it interesting that age and race/ethnicity separately predicted support for her. 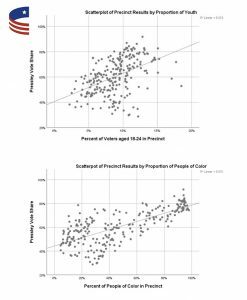 Or, to put it another way, she did well in student precincts that are predominantly white and upper-income as well as in low-income neighborhoods. [Press Release] – A 20-person panel of voters convened by the Massachusetts Citizens’ Initiative Review (CIR) pilot project has released its Citizens’ Statement on Question 1, the ballot question on nurse staffing limits. The Citizens’ Statement is intended to assist voters by providing them with the results of their fellow citizens’ four-day deliberation on the ballot question. It sets out the panel’s key findings as well as the strongest and most reliable reasons to support or oppose Question 1.The Citizens’ Statement is available online. The Massachusetts Citizens’ Initiative Review deliberations were held from September 12-15 at the Watertown Free Public Library. The campaigns for and against Question 1 both appeared before the citizen panel three times to present their arguments and answer questions. The citizen panelists also heard from seven neutral experts in fields relevant to nursing, patient safety, and healthcare. Trained facilitators guided the deliberations that resulted in the Citizens’ Statement. The Massachusetts CIR pilot project was organized by State Representative Jonathan Hecht in partnership with Tufts University’s Jonathan M. Tisch College of Civic Life and Healthy Democracy, the organization that pioneered CIR in Oregon and others states. Experience in Oregon, where CIR has been part of the official election process since 2011, has shown it to be a highly effective and well-received way to inform voters about complicated ballot measures. This is the second time Massachusetts Citizens’ Initiative Review has been used in Massachusetts. In 2016, 77% of voters who saw the Citizens’ Statement on marijuana legalization (Question 4) said it was helpful in making their decision. On major factual issues, voters who read the Citizens’ Statement were better informed and more confident in their knowledge than those who only read the official voter guide. John Gastil, Professor of Communications at Penn State and one of the nation’s leading CIR researchers, will conduct surveys to determine how helpful the 2018 Citizens’ Statement proves for Massachusetts voters. The 20-member citizen panel was selected from respondents to a mailer sent to 15,000 randomly-selected Massachusetts voters. I’m on vacation and not blogging, but I’m proud to help circulate a major new report from our Institute for Democracy & Higher Education entitled Election Imperatives. It recommends 10 strategies that colleges and universities should implement to improve political participation on college campuses in 2018 and beyond. The Chronicle of Higher Education ran an exclusive story on it this morning. More than a dozen national organizations are endorsing and disseminating the report, and you can see that list here. There is also a nice video gif of the report with photos. TALLAHASSEE — Gov. Rick Scott’s elections officials showed “a stark pattern of discrimination” in blocking early voting at state college and university campuses, a federal judge ruled Tuesday. We submitted an expert report in support of the plaintiffs this case. Political prognostication is a fool’s game and arguably a distraction from the important work of citizens, which is to influence–not to forecast–the future. Recent projections give the Democrats anywhere from a 39% to a 58% (or even 63%) chance of winning the House. One reputable model gives the Democrats a 30% chance of winning the Senate. Those two results are not truly independent, since both will be affected by the national situation in November. But they are substantially independent, as illustrated by the claim that an 8 percentage-point swing toward the Democrats would give them 44 more House seats and four fewer Senate seats. If we assume that the two elections are independent events, then Democrats have between a 43% and 70% chance of capturing at least one house of Congress. The wildcard is how the national situation will change between now and late October. If there’s a terrorist attack on the US, it will probably help the president’s party. The nomination battle could boost Republicans by giving religious conservatives a reason to turn out and by putting red-state Democratic Senators in a tough spot. Another four months of economic growth might help the GOP a bit, as would a report from the Special Counsel that comes nowhere close to associating Trump with crimes. But I think upcoming news is more likely to assist the Democrats. Trump and his party have already captured whatever political benefit they’re going to gain from the economy, and there’s a significant potential for economic turbulence ahead. The Mueller investigation has lost public support without yielding a damaging public report, but his report is coming. Since 67% of Americans want to preserve Roe v Wade, a nomination that places that decision in jeopardy could mobilize more people against Trump than for him. The North Korea summit was a political success for the president: he hyped a genuine crisis to the maximum and then declared it resolved, which convinced a bunch of Americans. But that domestic political gain is fragile, since the threat was not actually resolved. We can also expect massive Obamacare premium increases, ugly battles in Congress, plenty of awkward votes for Republican incumbents, a possibly damaging Special Counsel report, lawsuits and depositions against the president, and unpredictable controversies revolving around him. Overall, I’d put the chances that the Democrats control at least one house of Congress above 70%. That estimate is compatible with any actual result in November, so there’s no way I can be proven wrong. Meanwhile, stop reading forecasts and get back to work! On April 30, Reuters drew attention with the headline, “Exclusive: Democrats lose ground with millennials – Reuters/Ipsos poll.” The basis was a pair of online surveys of more than 16,000 registered voters under age 35 conducted in 2016 and 2018. In the 2016 survey, a generic Democratic House candidate beat a generic Republican by 28 points (55%-27%). In the 2018 survey, the lead had narrowed to 18 points (46%-28%). Among White men under 35, the generic Democrat lost 11 points between these surveys, and the generic Republican gained 10 points, putting the Republican ahead among this demographic group. It is important not to overstate the decline based on this single comparison. Democrats have held a consistent and substantial lead in generic House candidate surveys since 2017. According to Reuters’ own tracking poll, in the week ending May 6, 2018, a Democratic generic House candidate led a generic Republican by 24 points (44%-19.6%) among 18-29s. In contrast, Reuters is currently showing a Democratic lead of only 6.3 points for all adults. Over the whole period since June 2017, the Democratic ticket has always led the Republican ticket among 18-29s, and there is no sign of decline. Among age groups, under-30s have been by far the most favorable to Democrats. On the other hand, there is no question that young Americans view the Democratic Party brand with some skepticism, and this creates headwinds for candidates in 2018. Reuters reports that 34% of under-25s think that the Democrats have a better plan for the economy, but 32% prefer the Republicans’ plan–basically a tie. Even as surveys show young people becoming more likely to identify as “liberal,” they also show declining willingness to identify as Democrats (with most shifting to Independents). Thus, even while the nation saw a long (if slow) economic recovery under President Obama, Millennials were experiencing a rapid drop out of the middle class and drawing negative conclusions about the economic system. Since 2017, unemployment has fallen, and it’s possible that surveys would show some improvement in Millennials’ sense of their own economic circumstances under President Trump. Democrats must reach out to youth to capture the support of this constituency, which leans their way. Republicans can reasonably expect to contest the youth vote, if they try. Candidates should address a wide range of economic concerns, including but extending beyond college affordability. Antipathy to Donald Trump is real, but Millennials need other reasons to support Democrats. See also: the politics of student debt; the weakening bond between millennials and the middle class; new CIRCLE report on Millennials’ ideology; how Millennials split on some key issues; and how talking about Millennials obscures injustice. When Democratic political candidates are asked about “youth,” often the first issue that comes to their minds is college affordability. For example, when Hillary Clinton was asked during a Democratic primary debate about how she would reach Millennials, her whole answer was about student debt. I agree that student debt is a problem, but it’s not nearly as widespread as politicians assume. Nearly half of the debt is held by families in the top quartile, and for less advantaged younger Americans, student debt is only one of many challenges. Therefore, a much broader policy agenda is needed to engage the younger generation as a whole. According to Harvard’s Institute of Politics, 42% of Millennials say that they or anyone else in their household holds student debt. Pew reports that 37% of 18-29s hold student debt in their own names. That is a lot of people, but not a majority. Forty percent of Millennials do not take any college courses at all (whether in community colleges or four-year institutions). They don’t have college debt, and their immediate economic problems may be quite different: the minimum wage, daycare, job training, GED options. Another 38 percent enroll in college but don’t attain a BA. They have mixed experiences. Some of them incur debt but don’t hold degrees. However, according to Sandy Baum and Martha Johnson, 60% of graduates of public community colleges hold no student debt. They have Associates Degrees and are debt-free. Most of the people who borrow to obtain a 2-year degree attend for-profit institutions, and that’s a problem unto itself. But the loans get bigger as you go up the income ladder. Ratcliffe and McKernan report that people in the top quartile are least worried about their ability to repay their debt, yet they hold almost half of the dollars owed. It should not be surprising that the more education you attain, the higher your debt. This also means that the people with the most debt are young adults in white-collar professions. They may be struggling, and I am fully sympathetic to them, but they represent the upper socio-economic stratum. It would therefore be difficult to spend public money reducing debt without channeling most of the resources to upper-income young adults. More youth regard debt as a problem than personally hold debt. 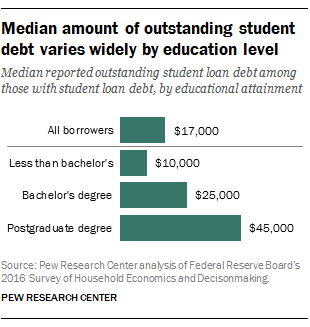 Fifty-seven percent tell Pew that “student debt is a major problem for young people in the United States.” One reason may be that the prospect of debt deters people from pursuing college at all (or keeps them from pursuing more costly four-year and postgraduate degrees). In that case, college affordability and debt would be challenges for more than the 35%-40% of Millennials who actually hold debt. But it’s a big assumption that the main reason people don’t pursue college degrees is the cost of tuition. 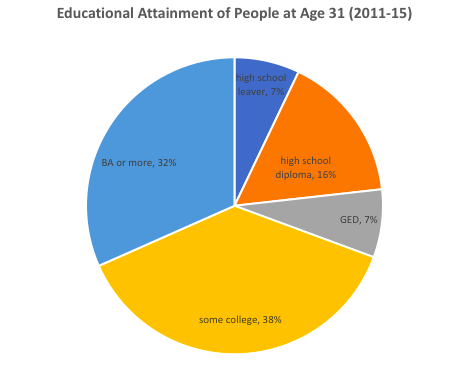 About 41% of 31-year olds have no more than a high school diploma. The next step up the SES ladder for them would be an Associates Degree, and 60% of people who graduate from public community colleges have no debt. There may be many reasons 41% of young adults can’t get Associates Degrees–and they may not even want one–but tuition is not likely the main obstacle. I’d be the last person to criticize reforms that make college more affordable. I just don’t think that this is the Rosetta Stone to the Millennial vote.